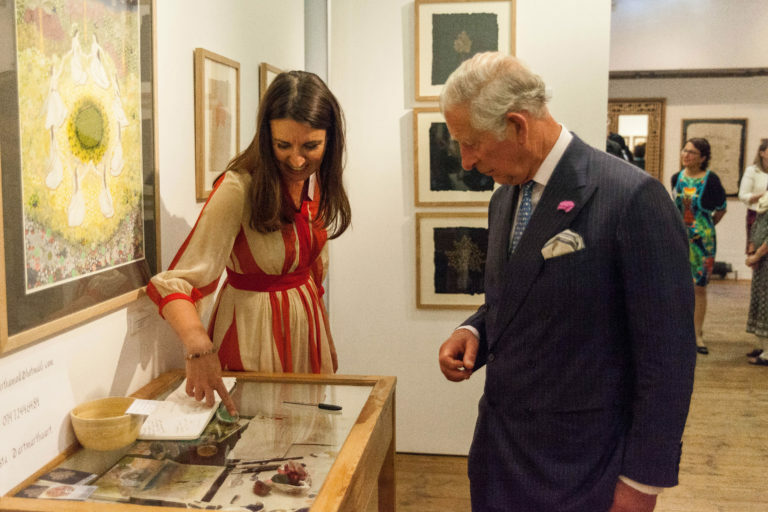 O n 5 July 2017, HRH The Prince of Wales attended The Prince’s School of Traditional Arts’ annual degree show ( 27 June until 7 July 2017) and awarded the new Bagri Prize to Martha Moderitz and Muhammad Samiur Rahman. Martha began her journey at The Prince’s School of Traditional Arts in 2013, first studying Persian Miniature Painting and geometry with the Open Programme at The School. During the first year of the MA programme, Martha experimented with an extensive range of arts and craft techniques and was notably introduced to Indian Miniature Painting. With a long fascination in Indian arts and philosophy, she was eager to further examine the concept of ‘Rasa’ (states of being) and female archetypes in the context of devotional love during the second year of her MA. Her paintings reveal her love for dance, geometry, nature and Pahari Miniature Paintings. These interests are reflected in her work Rasa Lila, the dance of Love (pictured below left). Samiur first became interested in practising Islamic calligraphy while at the Institute of Islamic Education and later studied contextual Islamic studies at the Cambridge Muslim College. He undertook a Masters course at The Prince’s School of Traditional Arts to further investigate geometry, Islamic calligraphy and its expression within an architectural context. While at The School, Samiur was introduced to several techniques such as parquetry, ceramics, and gilding on glass. Samiur’s theological background is often reflected into his pieces. One of the highlights of his MA work is a large parquetry panel with inlaid mother of pearl and smoky quartz, marking out the seven verses within the Surah Al Fatihah – the opening of the Qur’an – in Squared Kufic. The exhibition displayed beautiful work from The School’s graduating MA and MPhil students, with painting as well as geometry, calligraphy, stained glass and wood parquetry.